I just liked the way you can see how the frothed milk blends in with the espresso and you can see the foamy part just sitting on top. 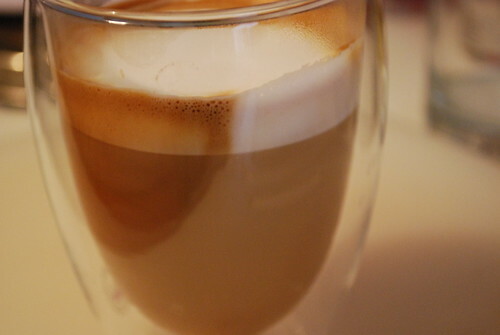 The added bonuses of this glass is that because it is double walled and mouth blown, you cannot feel the heat from the coffee when you hold the glass in your hand and it keeps the coffee hot for longer, plus of course it looks great, doesn’t it, especially when you pour latte art, with different shades of milk and espresso milk combinations ? If you want to impress your friends and love cooking and baking, then you can make a hot dessert in these glasses provided that the oven temperature doesn’t go over 180C and alternatively you can make cold desserts in them. 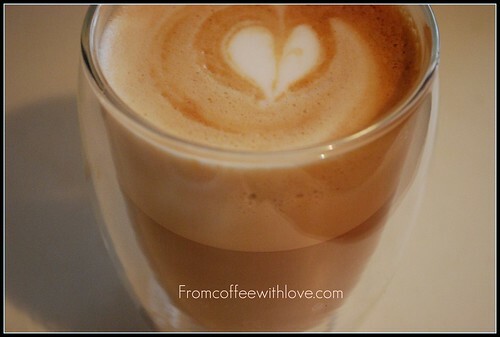 From the coffee side, the glass is just the right size for a double shot espresso Cappuccino or Caffe Latte. So, if you’ve got about €20 to spare during these tough economic times, then buy a set of two. This entry was posted on Thursday, January 29th, 2009 at 11:47 pm	and tagged with Bodum, glasses, latte art and posted in Coffee Tools, Thoughts. You can follow any responses to this entry through the RSS 2.0 feed.